Are they not the greatest of ingredients?! I use them all the time, unwaxed and organic preferably, and they are an invaluable help when planning a detox or just when I need a pick-me-up. Lemon juice and zest are great anti-ageing weapons because they protect the cells against oxidation and premature ageing. The oil stored in the zest is a fantastic mood uplifter and booster of your immune system. It has very efficient anti-bacterial and anti-viral properties so I use it in cooking and in the bathroom at the first onset of a cold. I put a few drops of lemon oil and grapefruit oil in a morning bath as an instant tonic or I love soaking a cloth, putting a few drops of lemon oil on it and letting it dry on a radiator in the living room or bedroom. The smell pervades the rooms throughout the house and it is like walking into a lemon grove!.. The essential oil or the juice can be used directly on the skin (but away from the sun!) and it works well to eliminate body odours or activate blood circulation in areas prone to water retention or dimples! But its best use in the bathroom is as an adjuvant to rinsing water for shiny, healthy hair. 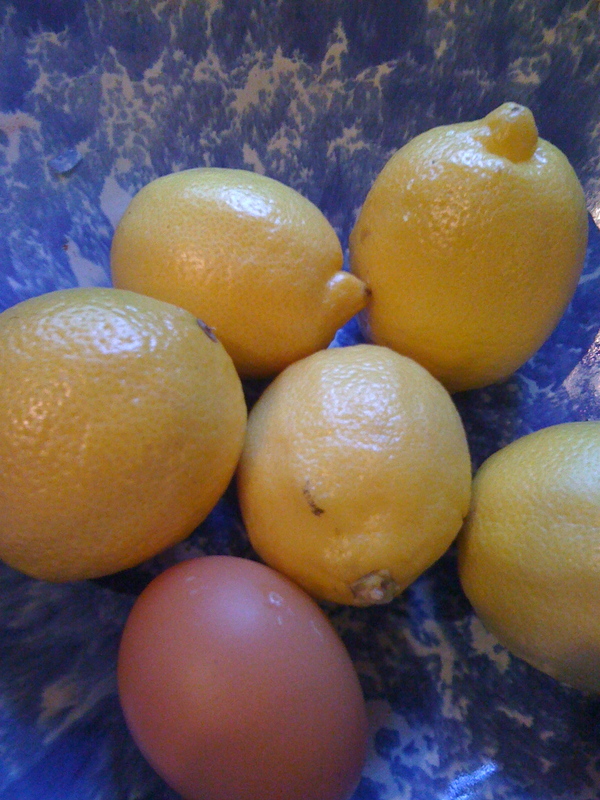 In the kitchen, half a lemon sprinkled with baking soda is a great tool to scrub wooden blocks or boards. It helps deodorise but also kills off most bacteria in the wood. During my detox, I drink a hot lemon juice in the morning: Just squeeze half a lemon into hot water and sweeten with a drop of Agave syrup if you find it too sharp. Add to it a pinch of cinnamon or cayenne pepper. This helps to start the day with a clear head and the spices boost the metabolism very efficiently so I burn calories and show TLC to my intestine at the same time. I try to leave half an hour before having breakfast- just time to get dressed for the day ahead! I’d love to hear of other recipes and uses for lemon, as I am quite sure this golden fruit is worth its weight in gold… To continue! This entry was posted in family favourite and tagged aromatherapy, detox, health, kitchen tips, lemon. Bookmark the permalink.